Can I put a shortcut to SkyDrive on my Windows 7 desktop? You certainly can, however, you need to use Internet Explorer 9. Sign in to your Windows Live account. Click “SkyDrive” on the menu bar to display your SkyDrive contents page. If your browser is maximized, click “Restore down” and resize the window so you can see some blank area of your desktop. In the browser address field note the small SkyDrive logo in front of the address. Move your pointer to that symbol. The message balloon will say “Drag to taskbar to pin site”. Drag the little logo to a blank area of your desktop. 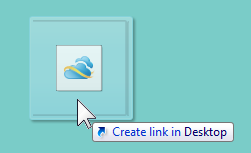 The SkyDrive logo will be bigger and the message balloon will say “Create a link in desktop”. Just let go the mouse button to drop the link. You will now have a desktop shortcut to your SkyDrive. If you opted to “Keep me signed in” the last time you signed in to Windows Live, this shortcut will launch your browser and take you right to your SkyDrive page. Just double-click the icon. This entry was posted in SkyDrive, Windows 7 and tagged desktop, shortcut, SkyDrive, Windows 7, Windows Live by Ludwig. Bookmark the permalink. Interesting post, can’t wait to try it out.